6 volt 35 amp positive earth alternator kit for the 1928-31 Model A Ford. These are a must for running the quartz or sealed beam headlights, or if you just simply want a more reliable charging system. Comes with tension brace and the new max-R pulley that drives at 3 times the engine speed. Mounting bracket is adjustable so the alternator can be shifted for proper belt alignment!. Made in USA. 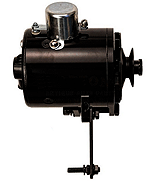 12-volt 60 amp Alternator kit for the 1928-31 Model A Ford. These are a must for running the quartz or sealed beam headlights, or if you just simply want a more reliable charging system. Comes with tension brace and the new max-R pulley that drives at 3 times the engine speed. 12 volt units are negative earth only. Mounting bracket is adjustable so the alternator can be shifted for proper belt alignment!. Made in USA. Alternator Pulley 1928-31. A new and improved part! This pulley has a smaller diameter than any other pulley that has been on the market to date. Therefore, it turns the alternator faster which is a plus on a model A motor. Fits any Delco or Ford alternator with a .670 shaft size. This newly redesigned alternator mounting kit is designed to help align the alternator pulley to the crank & fan pulley without the need for spacers or unsightly washers. 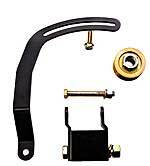 Comes with the alternator mounting bracket, a redesigned tension bracket, and grade 8 mounting hardware. Both brackets come painted and ready to install on your car. This is a "H" bracket used to mount the alternator in place of the generator. Adjusts with washers so you can shift the alternator forward or backward for belt alignment. If you are installing your own alternator setup on a Model A or B engine, this kit gives you the brackets to bolt the alternator where the generator was mounted along with a fan belt tension brace. Powerhouse Generator Bracket 1928-29. Used only with the early powerhouse generators. This brace ran from the generator to the timing cover. Exact copy. Made in USA. 6v Negative Earth Semi Conductor Cut Out. This is a state of the art semi-conductor cut out unit which modernizes and replaces the original relay type of past years. It is identical to original exterior appearance and dimensions and is plated in cadmium as original. Also includes authentic insulators and hardware. It is designed to continuously handle the maximum 20 ampere output of the original Ford DC third brush generator. It can be used on Model T and Negative Ground Ford DC third brush generators. Comes complete with all electrical hardware and instructions for use. 6v Positive Earth Semi Conductor Cut Out. This state of the art semi-conductor cut out unit modernizes and replaces the original relay type of past years. It is identical to original exterior appearance and dimensions and is plated in cadmium as original. Also includes authentic insulators and hardware. It is designed to continuously handle the maximum 20 ampere output of the original Ford DC third brush generator. It can be used on Model A and early V-8 positive ground systems. Positive Earth Diode Type Cutout. This is a 100% copy of the original style cutout, except for the modern internal diode, which will give better performance. Sticking points will be a thing of the past. Negative Earth Diode Type Cutout. Model A Ford generator cut out. This basic style positive earth relay version, has an identical appearance to the original. Cut-Out Mounting Screws 1928-31. Two screws and lock washers to hold the cutout to the generator. Made in USA. Generator Cut-Out Clip 1928-31. 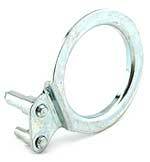 The clip that attaches to the side of the genenrator cut out and slips over the post coming out of the genenrator. If ordering a cut out, this clip will come with it already. Made in USA. Cut out Diode 1928-31. Make your old cut-out solid state by installing this diode. Can be installed in your old cut-out even if it is bad. Complete with instructions. Positive ground only. Made in USA. More advanced version of the diode kit, to make your old cut-out solid state. Complete with instructions. Positive ground only. Made in USA. 1930-31 Generator Armature. This is the one with the 1/2" tapered pulley and with 1" long bushing end. Note: The earlier version with the bearing at each end, is not available. 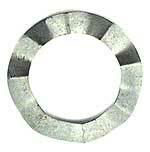 If you have an original cut-out, these are the special fibre washers that go where the bolts go through the cap. Made in USA. Generator Cut-Out Screws 1928-31. The two 10-32 x 1/2" thick headed hex screws with lock washers that go through terminals on original cut-outs. Made in USA. This set is for the earlier dynamo with the bearing at both ends and includes the screws to hold the support bracket to the generator, the cutout and bolt for pulley. All stainless, 14 pieces. (Not for early Powerhouse generator). This set is for the later dynamo with the bearing at the front and a bush at the rear. Includes the screws to hold the support bracket to the generator, the cutout and bolt for pulley. All stainless, 14 pieces. (Not for early Powerhouse generator). Generator Brush Set 1928-31. Set of three brushes for the model A generator and some later ones. Will not work on the early 28 powerhouse generator. Generator Brush Holder Bushing 1929-31. This bushing slips over the stud that the brush holder pivots on. Made in USA. Generator Field coil set for the standard 1928-31 Model A 6v Generator. 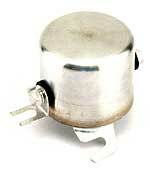 Generator Stop Pin Insulator 1929-31. 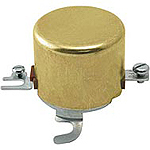 Generator Stop Pin Insulator 1929-31. Made in USA. Generator Brush Holder 1928-31. Generator Brush Holder 1928-31. Made in USA. Generator Spring 1928-31. Spring for the generator third and ground brush. Made in USA. (2 required). Left Hand Spring for the generator main brush. Made in USA. (one required). Generator 3rd Brush Plate 1929-31. The adjustable brush in the generator mounts on this plate. Made in USA. Generator Retainer Spring 1929-31. Used as the generators 3rd brush plate retainer. 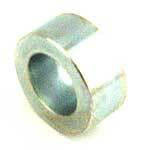 This style was used on the end plate with the oil hole on the side of the bearing. Has a slot in plate to hold tab of the spring in place. Made in USA. Generator Retainer Spring 1929-31. Used as the generators 3rd brush plate retainer. 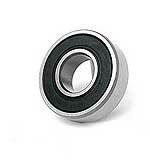 This style was used on the end plate with the oil hole in the middle of the bearing. Made in USA. Generator Stud Clip 1929-31. Small clip that keps the generator brush holder from coming of its pivot stud. Made in USA. This bearing was used only on the 1928 powerhouse style generators. Made in USA. Generator Bearing 1928-30. Used in the rear of the generator from late in 28 until mid 30. Made in USA. Generator Bearing Spacer 1928-31. Generator Bearing Spacer 1928-31. Made in USA. Generator Bearing Retainer plate 1928-31. This piece was originally riveted to the generator and plate. Made in USA. When you install a new front end plate bearing, these rivets are needed. This is a stainless screw-rivet 3/8" long, the head is a rivet, but the shaft is actually threaded. 4 screw rivets and nuts. Note: Rivets may need to be cut shorter so as not to hit armature windings. Generator Retaining Ring for the front bearing. Two required. Made in USA. This is a modern generator terminal post kit with insulators to repair a worn or broken terminals on the Model A Ford generator. (Not for early Powerhouse generator). Manufacturers fitting instructions are: post and thin insulating washer fitted from the inside. Thick insulator on the outside. Generator Terminal Bolt 1928-31. Mounts to genertor housing and this is what your cut-out attaches to. Made in USA. Generator Terminal Wire 1929-31. Solders to the head of the bolt that leads through casing to cut out. Made in USA. Authentic cloth covered wire for the distributor lower plate. The wire is a 100 strand wire for super flexibility. Also used on the Generator terminal post. When the post is at the opposite end to the brushes, this longer wire is required. Generator terminal post fibre bushing for the 1928-31 Model A Generator. Used to build up the space in the generator casing, where the terminal post comes through. Generator Post Washer for the 1929-31 Model A Generator. Made in USA. Generator Terminal Nut Kit 1928-30 Brass. Set contains lock washer and 2 correct 7/16" diameter 10/32 nuts.These are used where your cut-out attaches to the generator. Made in USA. Generator Terminal Nut Kit 1931 Copper. Set contains lock washer and 2 correct 7/16" diameter 10/32 nuts.These are used where your cut-out attaches to the generator. Made in USA. Generator Ground Lead 1929-31. Made in USA. This is tlat washer that goes between the bearing and the felt washer. Made in USA. Generator Bearing felt retainer for the 1929-31 Model A Generator. Made in USA. Generator Bearing Felt for the 1929-31 Model A Ford. 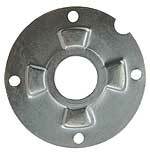 Generator End Plate Bushing 1930-31. A bushing was used in the rear end plate of the generator from April of 30 until the end of production. Made in USA. Powerhouse Generator Cover 1928-29. The cover and bail for the powerhouse style generator. Cad plated. Made in USA. Generator Pulley 1928-31. The late spoked design that was originally used from April of 1930 until the end of production. Will work on all short nose generators as is. If you have an earlier long nose generator it will still work, but you will need to purchase the A-10144-R adapter. Made in USA. Generator Pulley adapter 1928-31. This adapter allows you to use a generator pulley from a short nose generator on a long nose style generator.Offered by Ford in April of 1930. Generator Oil Cup 1930-32. This cad oil cup was used on the end plate of the 1930-32 generators. Made in USA. Generator Band 1928-31. Duplicate of the original band that covers the slots for accessing the brushes. Comes with the mounting hardware. Made in USA. Generator Cooler 1928-31. This is just what you need if your generator is hot stuff! It keeps the brushes and armature from overheating. Installs in a jiffy. This was an era accessory. Made in USA. Round headed machine screw and a square nut to hold the starter or generator band on. Made in USA. Generator Pulley Bolts 1/4". Special thin headed bolts with internal tooth lock washer. Two different sizes were used. Made in USA. Generator Pulley Bolts 5/16". Special thin headed bolts with internal tooth lock washer. Two different sizes were used. Made in USA. Generator Wick/Spring 1930-31. Goes in the rear end plate. Made in USA. Pivot Bolt & Nut 1928-31 Generator. Mounts the generator or alternator to the front of the motor. Note: The alternator mounting bolt is a bit longer for the thicker mounting bracket. Pivot Bolt & Nut 1928-31 Alternator. Mounts the generator or alternator to the front of the motor. Note: The alternator mounting bolt is a bit longer for the thicker mounting bracket. Generator Tension Brace 1928-31. A model A accessory that holds the generator tight against the fan belt. Made in USA. Powerhouse Generator Support Arm Gasket 1928-29. Used on the early style powerhouse. Made in USA. Powerhouse Generator Arm Gasket 1928-29. Goes between the mounting arm and the casing. Made in USA. Generator Through Bolt 1928-31. The "6 long fillister headed bolt that holds the generator together. Made in USA. Generator Through Bolt complete with nut & washer. The "6 long fillister headed bolt that holds the generator together. Generator Field Insulator for the 1929-31 Model A Ford generator.